For me you are a real hero! I'am soooo happy to see that you are working on all the problems and bugs which were ignored for a long time and also on new things. Yay, maybe soon I can play with all resources on abundant again without antimatter flooding the map. I've tried to go through the other posts here. But please let me know if there are other issues I should be checking out. Should Steam be showing me a 3.03 opt-in beta release? But please let me know if there are other issues I should be checking out. and that nicely spread the AIs out across all clusters. Is that something you might consider changing? I have to admit I don't know the ramifications it might have for games with large numbers of home worlds. Mr Paxton you are amazing and that support team of yours is above mediocre as well! Champions Temple improvement is only buildable if race is both Certain and Ancient. Since Certain owns the parent tech, it's clear that this is a bug (Solution: ImprovementDefs.xml, line 8483, must be changed to CertainAbility). Black Market improvement is only buildable if race is both Unrelenting and Slavers (credit goes to Gwyrddu). Since Unrelenting owns the parent tech, it's clear that this is a bug (Solution: ImprovementDefs.xml, line 7994, must be changed to UnrelentingAbility). Mechanic citizen does not get the +1% to Research stated in the description (credit goes to Horemvore). Description states +1% to Research per lvl, but since Mechanic cannot gain levels (global pool only), the 'per level' is most probably just an error in the description (Solution: UnitGlobalStatDefs.xml, line 93ff, insert EffectType for +1% to Research and UnitSpecializationText.xml, line 95, delete the 'per level'). Determined racial ability does not give the +5 to Ship Range (credits go to Red Earth and Horemvore). According to Horemvore, solution is: AbilityDefs.xml, line 550, TargetType must be changed from 'Faction' to 'Ship'. Galactic Showcase improvement bonuses to Influence, Gross Income and Gross Income per lvl are actually civ-wide, which contradicts the description. I assume the civ-wide bonus is intentional, so solution would be: ImprovementText.xml, line 1265, specify that it affects all worlds. Recovery tech gives +1.0 to Mining. Since all other increases to Mining in the game are +0.1, this should probably also be +0.1. Location: folder DLC3_Snathi, SnathiTechDefs.xml, line 3724. Shadow Temple gives +0.5 to Diplomacy which is just insane for a one-per-planet improvement. Location: ImprovementDefs.xml, line 9751. No, I haven't released an optin yet. I just put the post up so you guys can see what's coming. Here's an issue that may not have ever been reported. I don't remember doing it, and I don't remember seeing it anywhere. ShipComponentDefs.xml has costs for prototype Elerium, Antimatter and Durantium weapons. The Elerium weapon costs 1 Elerium. The Antimatter weapon costs 2 Antimatter. In the base game the Durantium weapon costs 1 Durantium. In Crusade it costs 12 Durantium. It looks like someone accidentally pressed the 1 and the 2 to get 12. This makes some ships using kinetic weapons very costly in Durantium. Thanks for all the support, Derek. We really appreciate it! Im playing with this now, it does seem to be a better distribution. I'm going to keep trying it out, but for now its in. These will all be in 3.03. Thank you for the bugs, and thank you even more for the fixes!!! Wow, thanks for the quick changes! Here's another one that might need to be fixed. The Colonial Hospital has a flat +0.2 to growth. Its upgrade, the Xeno Medical Center, has a flat +0.1 and a multiplier of .25. For most planets, the change from a flat +0.2 to +0.1 is a downgrade, even with the additional 25% multiplier. For my own games I have "fixed" this by changing the Colonial Hospital to have a +0.1 flat growth, the same as the Xeno Medical Center, so that the latter is a true upgrade of the former. Any chance of adding invert camera/mouse option, even as just an xml config file toggle? Any chance of removing the hard locks on the map sizes? I love to play on immense/insane maps and I don't care about the chug. I will eventually upgrade (computer needs a full upgrade not just a RAM upgrade) my computer but it will be awhile. Kael - I posted an issue on Discord (5/13) that I had with the Sylne when I tried to play 3.02 that I had never seen. They were so overpowered that they were 10x more powerful than anyone else right at the start of the game. When I started a game without them all was back to normal. I didn't see anyone else commenting that they were seeing this, but since I was able to replicate the behavior in a 2nd game I thought it may be some change in their code for 3.02. This fix has had a huge effect on my economics, as large fleets now cost quite a bit to maintain. Same for AI. A real game changer, good catch. While not a simple XML edit, any chance we can get the AI to use counter-spies to nullify a player's spies when used to disable improvements? I guess this fix would hurt the human player more early-game, but later would drastically hamper the AI (when the human player has Tourism buildings and economic starbases up he won't care anymore). They should be careful with fixing that, it might require additional balancing efforts. 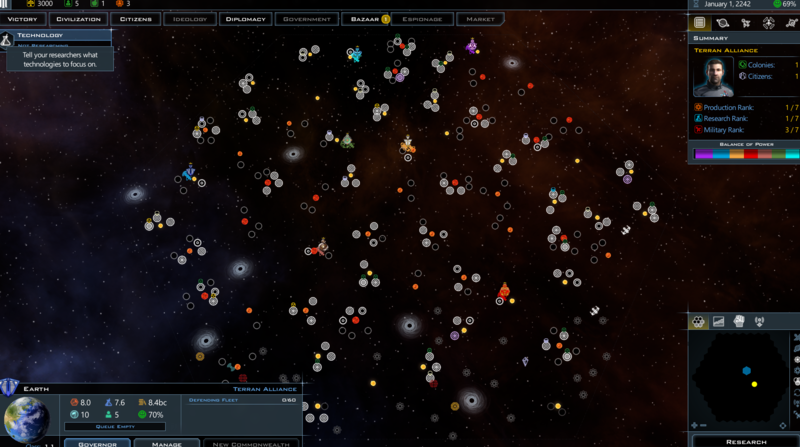 Fleet management screen still doesn’t work correctly when fleet contains a commander that increases logistics points. It displays increased logistics but refuses to let you make a fleet past the normal limit. We have to resort to moving the ships around individually on the map in a very specific order to take advantage of the logistics bonus. This has been a bug since 2.0 / Crusade was launched. on that note, it would also be nice if promoted commanders did not lose this bonus. Currently, they are mostly a downgrade. When 3.03 will release you really should give this patch a very important name like "3.03 Rebirth" or something like that. You should promote it very aggressive at Facebook, steam, discord and so on! Because its a very important patch and a more important signal to the fans of the game that their whishes are important and its a big chance to get players back who's gone in the past! I see this same issue with Entertainment Centers in the base game, where upgrades are actually downgrades. Entertainment Centers give a flat +1 with +1/level adjacency bonus, but its upgrades, Entertainment Network and Stadium, only gives 20% and 25% respectively, with an adjacency bonus of +0.1/level. This is basically a massive downgrade.